In short, more inequality at any point in time is associated with a greater transfer of economic status across the generations. In more unequal societies, the poor are more likely to see their children grow up to be the next generation of poor, and the rich are more likely to see their children remain at the top rungs of the economic ladder. The United States occupies a position at the very top of the curve relative to many of the other rich countries to which it is often compared. High levels of inequality experienced about a generation ago are associated with a strong tie between family background and adult earnings for the cohort of people who approximately were born in the early 1960s, attended school from the late 1960s through the 1980s, and got their first foothold in the labor market in the late 1980s and 1990s. What do the underlying statistics mean, and, in particular, [are they] appropriate for understanding equality of opportunity? What are the underlying causes of economic opportunity? What will happen to the opportunities of the current and coming generations of young people, given that inequality has risen further over the past couple of decades? 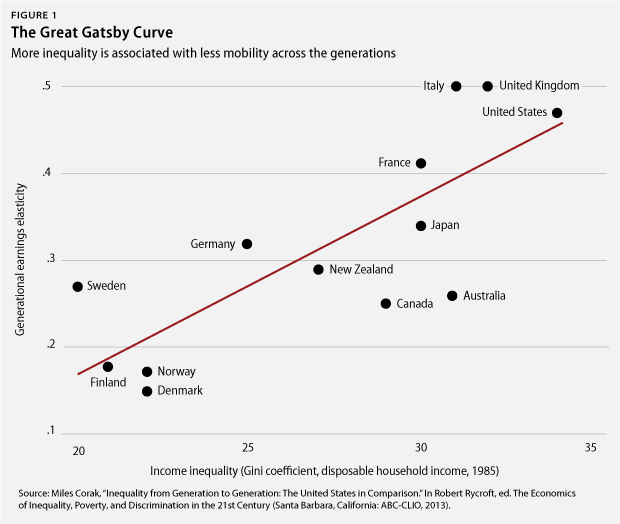 These are important questions because they help us to appreciate the implications of economic inequality and mobility for public policy: How should we think about sliding down the Great Gatsby Curve? Is that desirable? How is it possible? The research paper seeks to answer these questions. You can download a copy here. Is the Canadian data an updated cohort form your previous work as I notice the generational earnings elasticity has changed (in a negative direction), or does it reflect a recalculation of the previous cohort? The Canadian estimate of the intergenerational elasticity was originally about 0.2, and now I am using 0.25. This reflects some new work I did with information on the same individuals that formed the data for the original data, but at an older age. The cohort is the same, they are just older. They are now in their early 40s rather than their early 30s. Income measured at this point in the life cycle more closely approximates “permanent income”.